Lt. 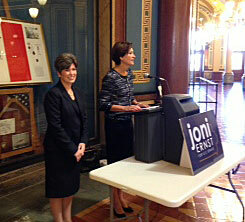 Governor Kim Reynolds (right) endorses Joni Ernst for the U.S. Senate. Lieutenant Governor Kim Reynolds has endorsed Joni Ernst, one of a handful of Republicans but the only woman running for the Republican Party’s 2014 U.S. Senate nomination. “Joni Ernst represents the best of the Republican Party and she represents the best of Iowa,” Reynolds said during a speech in the statehouse rotunda to mark the endorsement. Reynolds and Ernst first met when they were county officials in southwest Iowa. Reynolds later encouraged Ernst to run for the state senate seat Reynolds left when she became lieutenant governor. Ernst said she was “humbled” by the endorsement. Less than an hour earlier during his weekly news conference, Governor Terry Branstad suggested endorsements from elected officials don’t matter much. Reynolds and Ernst both served as county auditors before their elections to the state senate. Reynolds thought about running for the U.S. Senate herself in 2014 but, after deciding against it, she encouraged Ernst to run for the seat. Five other men have stepped forward to run for the GOP’s senate nomination, too, and a sixth may enter the race soon. Congressman Bruce Braley is the only Democratic candidate running for the U.S. Senate.